The IDF on Saturday attacked peaceful Palestinians with tear gas, rubber bullets, live bullets and pepper spray at point-blank range. Their crime? Setting up a protest camp in the West Bank village of Burin to demonstrate against Israeli settlement expansions and violence perpetrated against Palestinian civilians by local settlers. 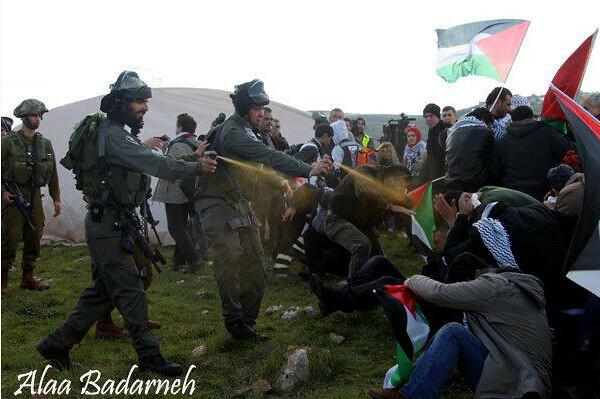 Seated Palestinians dispersed by IDF soldiers using pepper spray. Image by Alaa Badarheh. For the third time in as many weeks, Palestinians set up such a protest camp on village lands, only to be attacked by local settlers and the IDF. This time, approximately 300 villagers erected a “neighborhood” made of tents and metal shacks on privately-owned land in Burin, which resides in Area B. Soon thereafter, settlers attacked the peaceful demonstrators with stones – on their own lands – and the IDF swiftly moved in, directing their force upon the seated Palestinians. 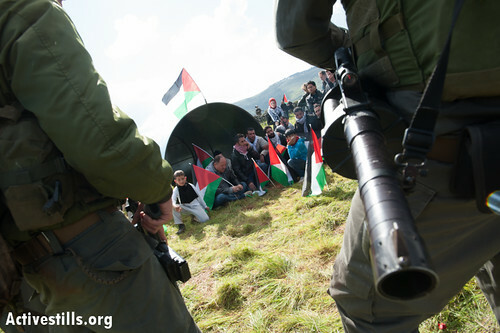 IDF soldiers move in on seated families in the village of Burin. Reports are that a 16-year-old Palestinian was injured by live fire, 20 Palestinians were treated for tear gas inhalation, still others for pepper spray burns, and a mosque was reportedly set alight by local settlers. This is just another day in the occupied West Bank. Another day in which asymmetrical military rule props up settler violence and encroachments while suppressing non-violent Palestinian resistance to such rule. There has never been any balance in the West Bank, with Palestinian civilians oppressed by an unequal, often brutal set of military dictates that do not apply to nearby settlers – Israeli Jews. This is why people who characterize the reality of life for Palestinians in the West Bank as apartheid are correct. For the two-tired justice system applied in the West Bank – military rule for Palestinians and democratic rule for Israeli Jews – is exactly that. Even Jeffrey Goldberg, a moderate voice if ever there was one, admits that apartheid is the correct term, albeit charged, to describe the West Bank’s realities. IDF soldiers pepper spray an already-subdued Palestinian at point-blank range. Today in Burin was just one more example of that: Palestinians being pepper sprayed at point-blank range by heavily-armed soldiers for erecting temporary structures on their own lands. Today in Burin was just one more reason why Israel must be compelled by the international community to end its occupation, for as the recent elections have shown, the country is incapable of ending the occupation on its own. What can we do to stop this kind of action by the settlers and the IDF? Lobby your U.S. representatives to support pro-peace initiatives and to reject AIPAC & so-called pro-Israel (extremist) positions. I think there is a more urgent issue, the plight of Palestinian refugee in Syria who are caught in a bloody civil war. Abbas rejected an offer by Bibi to allow this settlement in the West Bank. Abbas said that he would sooner see them die rather then give up the demand for their settlement within pre-67 Israel. Can we do something to change Abbas’s mind? If only the same kind of concern was shown by this author with respect to the threats against Israel and Jews, not to mentioned other peoples that suffer far more than the Palestinians. It is only against Israel, and sometimes America, that there is outrage. The reality is that this author consistently adopts the Palestinian and Arab narrative that calls for an end to Israel and even the genocide of Jews, as if all the Jew hatred is a consequence of Jewish self-determination, which this author abhors. Sorry, but someone has to say this. It is time for the enabling of anti-Jewish forces to be identified. Gershon is an apologist for Abbas and the PA. The IDF soldiers pepper spraying the seated Palestinian protesters looked exactly like the University of California at Davis police pepper spraying the seated student protesters. Maybe because I’m a UCD alumni. I’m never surprised that there are always those who are willing to defend the indefensible, though. I figure I’ll post this link here, just in case this very, very concerned polemicist forgot to crosspost his latest thoughts on Israel and “The Jewish Lobby” here, where it might perhaps maybe be misinterpreted. Folks can and will draw their own conclusion as to David Harris-Gershon’s motivations and ideas from the above link. My question is why does this gentleman have a platform such as this to push his poison? It’s always nice to see my “David is an anti-Semite because he critiques Israel” fans from Daily Kos make an appearance here at Tikkun. This is a lovely publication, and I hope you stay to peruse many of the articles, both spiritual and political. I’m sure you’ll find it a wonderful experience, and that my brand of progressivism is suited perfectly here. Please visit regularly. Critique is one thing, but it is well past that stage, and the fair folks here should not be misled about the deception. You do not engage in mere critique, but rather demonization as witnessed by the diary above to which I linked (of course, I was correct in that you never did intend to crosspost that here – I wonder why that is? ), and your predilection to whip the bigots at that site into regular frenzies. It is disgusting. Don’t try to play the persecuted victim, when you are one of the leading enablers of online antisemitism amongst the left these days. Your fanatical anti-Israelism is no brand of ‘progressivism’ I recognize. Here’s an idea – there would be no ammunition as such to use against you, if you did not provide it yourself. I didn’t force you to make the dual loyalty and ZOG accusations you made in that diary yesterday. JayinPhiladelphia: It’s hard to believe that you are sincere. It seems implausible that real people would be unable to tell the difference between hatred of jews and opposition to a political opinion held by some jews. It gets even weirder when you start talking about ZOG and a second holocaust when all the guy you’re responding to said was that US politicians are disproportionately obsessed with Israel. Only a madman would say that some sort of ZOG conspiracy exists, and only another madman would say that the pro-Israel lobby doesn’t. It reaches an apex of weirdness when the guy you are calling an antisemite is himself jewish. It’s as though I spoke out against the overt political efforts of white seperatists, and was immediately called a self-hating white man who believes in the Illuminati and wants to see all white men destroyed. It’s insane, it’s gibberish. The only rational explanation is that this kind of thing is an attempt to bully critics of your politics into shutting up, and to scare people off from associating with them because they have “Hitler Cooties”. Hi, I do believe this is a great website. I stumbledupon it ;) I am going to return once again since i have book marked it. Money and freedom is the best way to change, may you be rich and continue to help others. 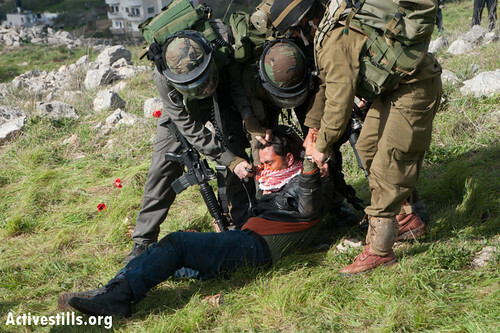 I have seen first hand the brutal work of the Israeli army and have been teargassed personally in Bi’lin, in a march led by Iyad Buryat–his brother has made a movie “Five Broken Cameras” that should be seen. The marchers go up the fence–why can;t the army just let them march around–no, they have to use rubber bullets, tear gas–some canisters have killed people–dirty water, and other means. It’s a charade–the army just does not know what to do ==it doesn;t want to do this to unarmed people–it just does. I recommend that people travel to B’i'lin on a Thursday they will be put up overnite and on Friday after prayers will join dozens of marchers from a dozen countries–the so-called “internationals” and see forthemselves. You will be warmly greeted and put up for free with food by Iyad and his friends. Bi’lin is a short ride northwest of ramallah. Im shallah.